2 Year Warranty: Warranty returns must be routed through the manufacturer. Please call A-iPOWER Corp. at 1-855-888-3598 to obtain warranty services. JEGS will only accept returns for unused generators. JEGS Inverter Generator provides 2,000 watts of starting power and 1,600 watts of running power to deliver clean, quiet performance. With the easy-pull recoil it is easy to start, and with a 1.1-gallon fuel tank, the generator provides up to 7 hours of run time at 50% load. 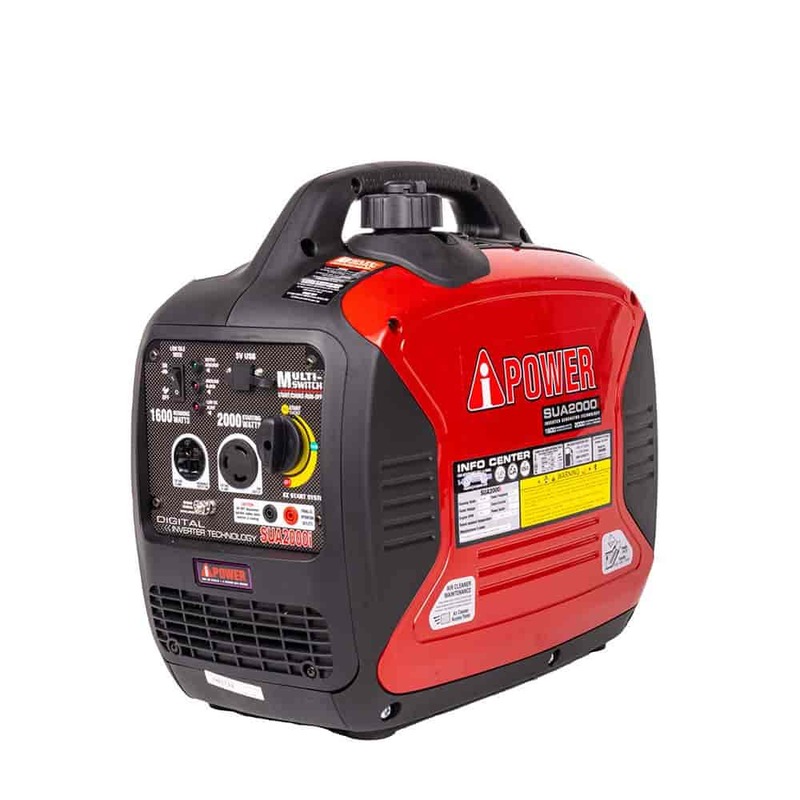 The Inverter Generator features a gas-saving and noise-reducing eco-throttle that automatically adjusts engine speed to the most efficient level; and comes complete with parallel cables so you can link two generators for double the power. The Generator only weighs 46 lbs. and rates at 65dBA for assured power and quiet operation that is ideal for any outdoor event. 81963 is rated 4.8 out of 5 by 18. Rated 5 out of 5 by Luke E from Very quiet So far so good, it's very easy to use and very quiet. Even cheaper than harbor freights comp. The eco mode works excellent saving on gas and extending run time. Still breaking it in but im happy with this purchase. Rated 5 out of 5 by ryanruhr24 from Great buy awesome generator Bought this to power my camper and very impressed with it. Its light and quiet bets the price of a honda. With all the extras is comes with cant bet it. I will buy another one soon to run them together. Rated 5 out of 5 by MR airstream from WOWZER first impressions are better than expected I have owned lots outboard motors and tinker around I have to say this thing is smooth for one cyl! Sure Honda plastic pieces will be more robust and electronics more robust but for what you get I could not be happier. Ran tested 30 minutes however unit would not power 11000 btu AC at 5000 feet altitude with trailer battery charger going. Will play around some more. If motor is hot no need to choke put on run and fired up first pull. Cold engine put on choke then move to run. Thumbs up! Rated 5 out of 5 by C5vetteike from JEGS Aipower 2000 watt inverter Added oil (manual said it was supplied, not) started on first pull. Ran with a load for 15 mins, ran fine, low noise level. Will use this camping and pair with my Yamaha Aipower Inverter. Exact same except this one has a clone Yamaha motor and $150 bucks cheaper. Work great together. Rated 5 out of 5 by PapaNBama from Great Little Inv. Generator I bought this inverter generator to power sensitive electronics during power outages. I found an article on the net on how to break in these small units which basically means repeated cycles of running no load, change oil, small load, change oil, etc and so far, it has run perfectly. I called Jegs customer service to ck that this unit was back ordered, at the time and they were great...all in all, the experience with this inverter generator and Jegs has been great. Highly recommend both. Is it garage tool friendly like a palm sander or air brush for house work. It will depend on the amp requirements for the tools you are using, but it will work with most of those style tools. Can it be paralleled with a honda EU2000i? This can be used to work in parallel. This does not have a fuel pump. JEGS W53998 - Portable Safe 8.2" x 5.9" x 2.2"